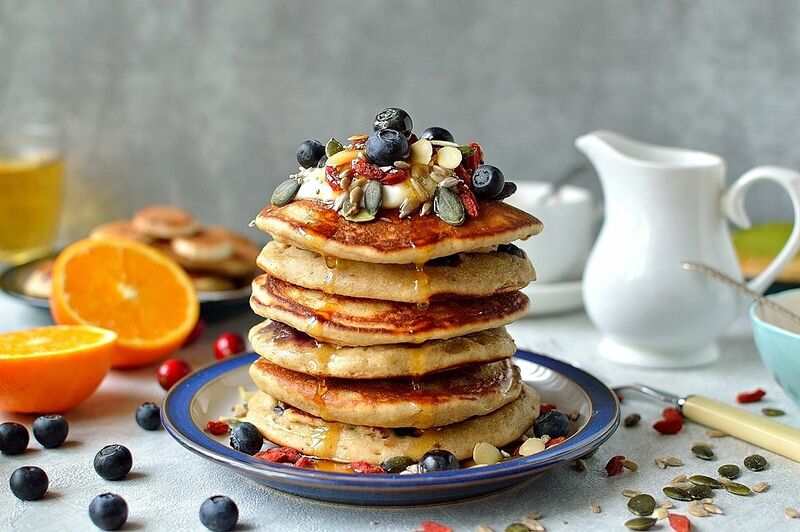 These healthy superfood pancakes are a delicious weekend breakfast that is packed full of highly nutritious ingredients and lets you indulge without the guilt. So the festive period is over, we’ve seen in the New Year, and it is sadly time to pack away the tree and decorations. Now is the time that a lot of people (myself included), realise just how much they overindulged over Christmas and resolve to start eating more healthily. The problem is that January is the worst time of year to start dieting! It is cold, dark and miserable outside and I crave hearty comfort food, not salad! I tend to make a lot of soup if I am trying to eat healthily in the winter – it is one of the few foods that is both healthy and comforting; but I don’t want soup for breakfast. 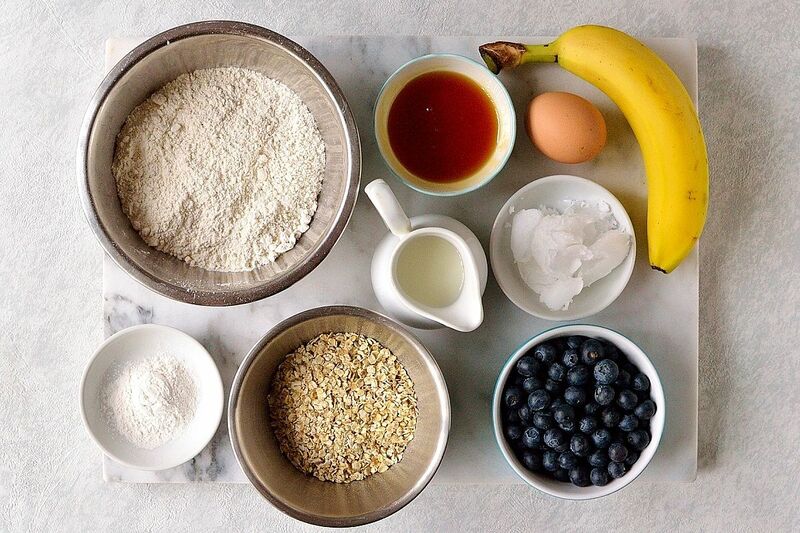 Porridge will do on weekdays, but at the weekend it is nice to have a slightly more special breakfast which is why I came up with these healthy superfood pancakes, they allow you to have a seemingly indulgent breakfast but are actually packed full of healthy, nourishing ingredients. 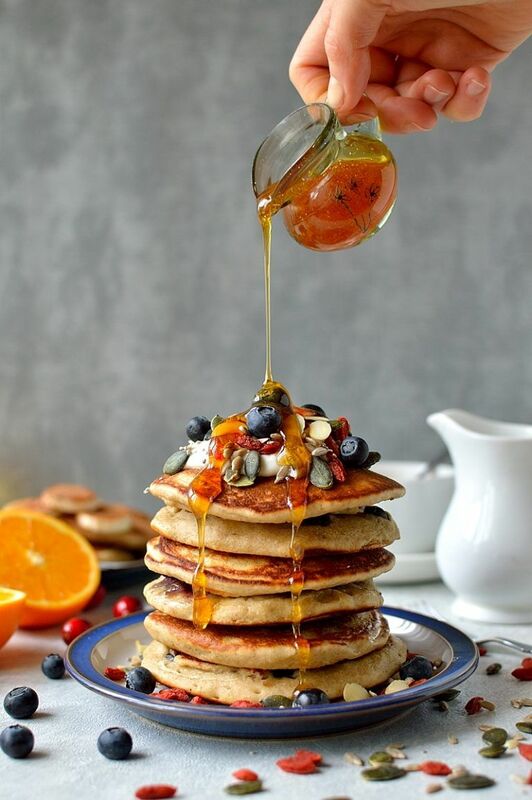 The pancakes themselves are made with spelt flour and ground oats, both of which are much better for you than the usual white flour, and will keep you full for longer. They are sweetened with banana, a bit of manuka honey and a scattering of blueberries, all of which are so incredibly good for you. The pancakes are a little more dense than regular ones due to the oats, but are still fluffy and delicious; and you can eat them without feeling guilty afterwards. The best bit about any pancakes is the toppings, and these are no exception. 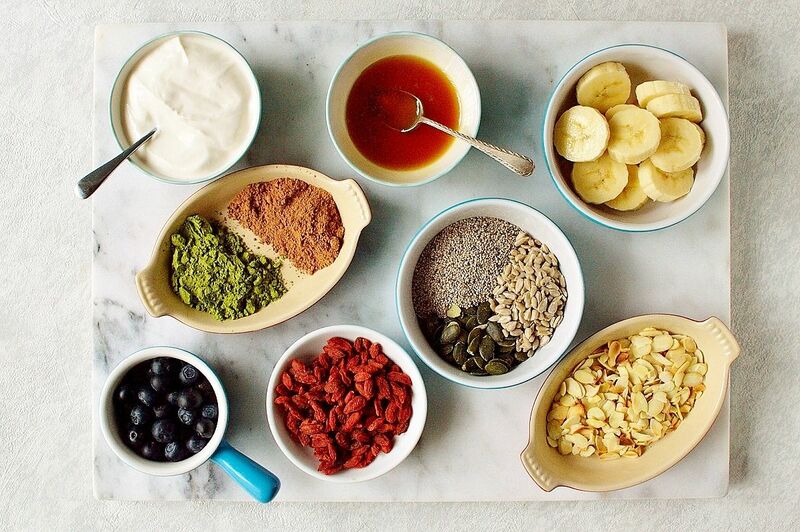 I chose to top mine with a selection of superfoods including goji berries, toasted flaked almonds, skyr yoghurt (a thick Icelandic yoghurt that is high in protein and low fat), seeds, extra blueberries and sliced banana, a drizzle of manuka honey and a dusting of cacao and matcha powder. 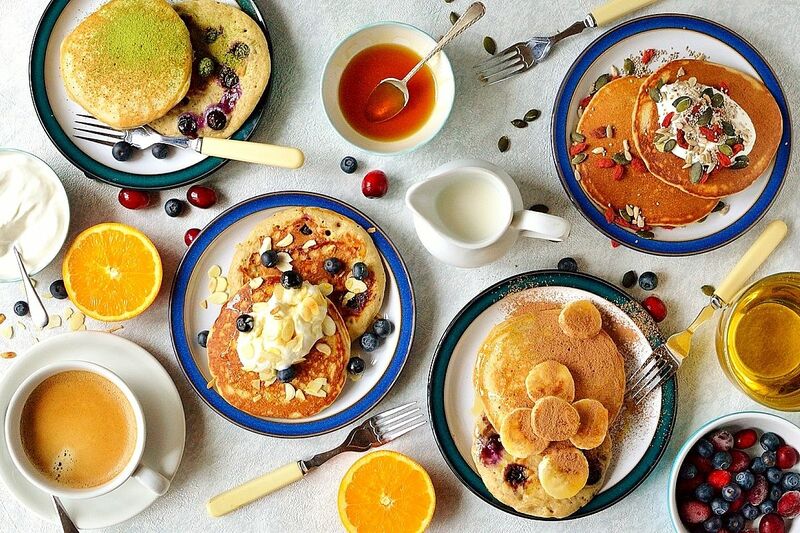 I think it’s a nice idea to provide a range of toppings and let everyone choose how they want to top their own pancakes; that way they are sure to be a big hit with all the family! 1.Place the oats in a blender and blend until fairly finely ground. Add the banana, egg, milk and honey and blend until smooth. 2.Add the flour and baking powder to the blender and blend again until smooth, it should form a thickish batter, if it is too thick you can add a splash of milk to thin it a little. 3.Place a frying pan over a low heat and lightly grease with coconut oil. Use a ¼ cup measure to pour some of the batter into the pan; scatter a few blueberries over the top and cook until the surface is bubbly and no longer looks wet. 4.Flip the pancake over and cook for a couple of minutes on the other side until golden; transfer to a plate and keep warm while you cook the rest of the pancakes (you can cook a few at a time). 5.Top with your choice of superfood toppings and serve!